As Carlisle continues to grow, one local amenity that is clearly missing is a nice hotel and convention center. That may be changing considering the conversations and progress being made by Boulders Inn & Suites. Unlike larger, brand-name hotel chains, the Boulders Inn & Suites business model was designed specifically for smaller communities like Carlisle. 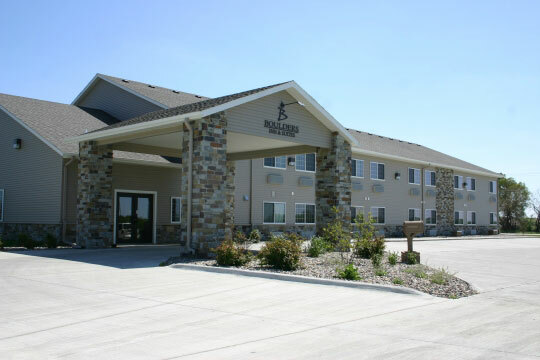 The first Boulder Inn & Suites was introduced in 2008 when the 32 room hotel opened its doors in Denison, Iowa. Since 2008, the company has expanded to nine hotels in Iowa with more locations being considered. Before announcing a new facility, the hotel’s management group, Boulders Inn & Suites Consulting, based in Denison Iowa, follows a proven formula for finding locations, gaining local support and raising money through current and local investors. Once Boulders Inn & Suites Consulting identifies an interested community, a feasibility study is commissioned to determine the financial viability of the location. Pending the results of the study the company proceeds with its proven formula. The next step is an investors meeting to help secure the financing for an investment ranging from $1.5 to over $2 million in capital. The initial investment meeting, held on February 26th in Carlisle, drew a crowd of roughly 50 interested parties. Some came for additional information while others, who were interested in the investment opportunity, are in on-going conversations with Boulder Inn & Suites Consulting. Houston continues, “The success of our brand and investment model is a proven strategy. In fact, we’re opening our second 32 room hotel in Denison, a community of roughly 8,500 residents. Boulders Inn & Suites Consulting hires the local managers for each hotel and provides the infrastructure as a management company with responsibility for the accounting, human resources and marketing functions. Hospitably, customer service and local decisions are the responsibility of the local managers. Houston continues, “A few months before opening, we’ll start the hiring process for a manager. We look for managers who are passionate about customer service and have a vested interest in their community. We want our managers to be involved in the local Chamber of Commerce, Kiwanis or Young Professionals as a way to give back to their community. “With the manager on board, together we’ll hire another full time employee and up to 10 part time employees. With the addition of an adjacent restaurant, the whole project could add an additional 30 to 40 jobs. “We believe Boulders Inn & Suites represents the best brand value based on our high quality guest rooms and suites. Boulders Inn & Suites properties are non-smoking and equipped with a fitness center, business center, free wireless, and a breakfast bar where guests are offered a complimentary hot breakfast each morning. Modern rooms are equipped with iron/ironing board, top of the line bedding, comfortable seating, microwaves/refrigerators, and a well-lit work area. If you or someone you know is interested in becoming an investor in Boulder Inn & Suites, please contact Hollie Askey at Warren County Economic Development Corporation. 515-961-1067.